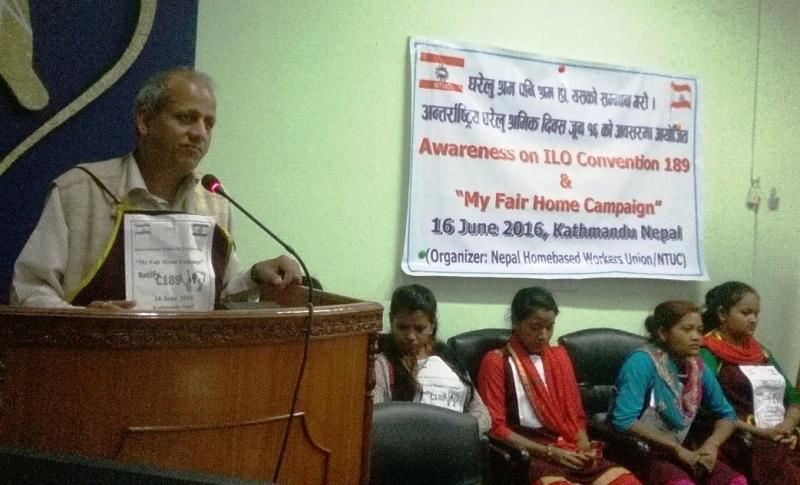 Nepal Home workers Union affiliates of Nepal Trade Union Congress organized a conference on “Awareness on ILO Convention C189 and My Fair Home Campaign” to observe the 5th Anniversary of C189 and as the International Domestic Workers Day. Khila Nath Dahal president of NTUC addressed the conference. He outlined that “This is a great day for the domestic workers; the domestic workers now have got their own convention”. Now they are very near to get the real victory in their own home country, they will get recognized and the domestic work will be in equal treatment once the C189 be passed by their home country. NTUC and other trade unions of Nepal are pressurizing Nepal government to ratify the convention urgently. Many domestic workers have shared their issues and concerns related to their work and employers. Mrs. Rama Paudyal -Women Vice President of NTUC, Member of Parliament from NTUC Mr. Pushkar Acharya, Ms. Bharati Sharma Pokharel of ILO Nepal, Sita Rana from Swotantra Abhiyan Nepal, Sagar Bhandari from CWIN Nepal also showed their solidarity and commitment to support the case of domestic workers. Usha Bhandari President of Nepal Home Workers’ Union highlighted the issues of organizing she emphasized when they are organized!They get their rights. Nepal Home Workers Union adopted a 9 point resolution for the next 1 year of activities supporting to the domestic workers. 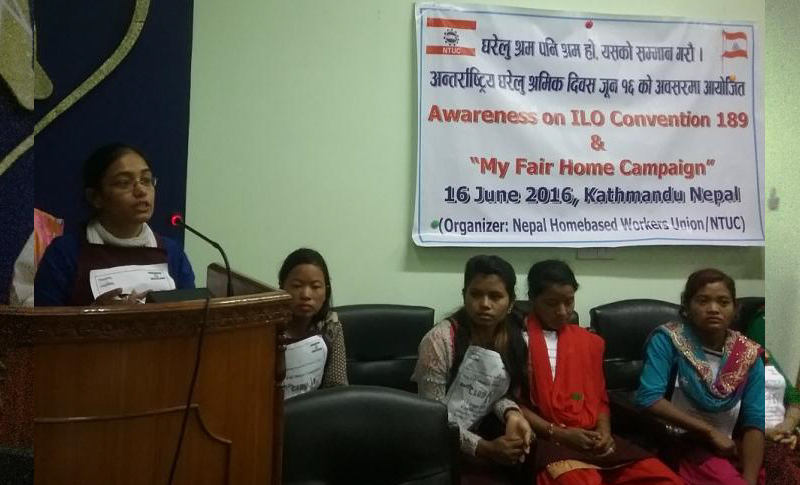 The My Fair Home campaign agenda of IDWF/ILO was also talked during the conference. In Nepal, domestic work and domestic workers are counted as informal work and informal workers respectively and, is excluded from the labour law coverage. It is estimated that there are more than 200 thousand domestic workers engaged in the domestic work throughout the nation. Other double sizes the numbers are in foreign countries as migrant domestic workers. Prior to the conference, NTUC/Nepal Home Workers’Union handed over a memorandum to the Ministry of Labour demanding the commitment of the ratification of ILO C189 from the Governmentof Labour. Labour and Employment Secretary Mr. Bishnu Lamsal received the letter and informed the delegation that Nepal Government has appointed a consultant to look over and find out the possibilities of ratification ILO Conventions and its consequences. The delegation was led by NTUC Women Vice President Rama Paudel. NTUC Vice President Ayodhya Yadav, Home Workers Union Usha Bhandari, Home Workers Union Organizer Devi Lamsal and NTUC Executive Officer Tilak Jang Khadka were also in the delegation team to the ministry of labour and employment. There were 70 domestic workers from the Bagmati Region of Nepal in the conference.